‘Poet Jung Myung Seok is someone who has opened his eyes to the mysterious and profound wonders of the world created by the Creator. He discovered the law of creation, which states that nature is like human beings, and human beings are like God. In his poems, he ties together and connects a variety of difficult concepts [within this theme]. Then he gains the power to embrace both heaven and earth. He pursues an ideal world and at the same time, reveals [in his poem] his strong will to maintain his optimism and endure his difficult life. 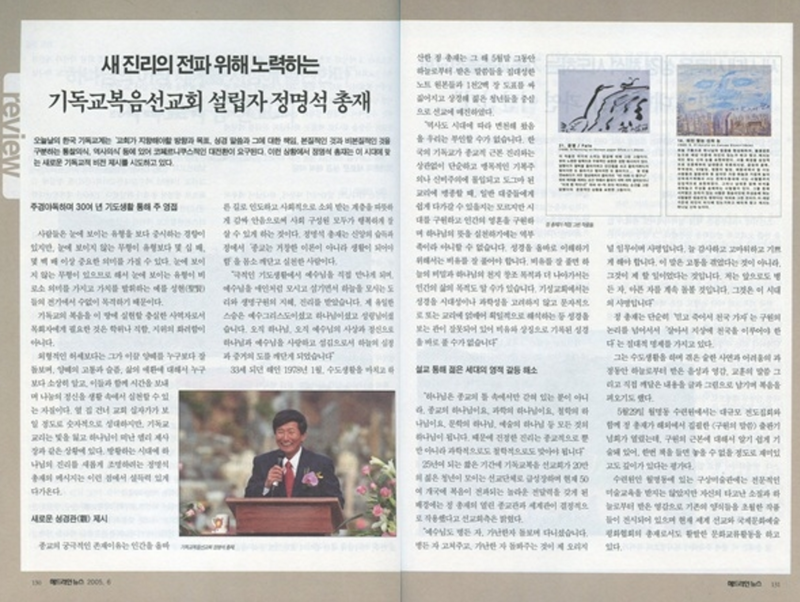 Along with 3500 others, President Jung Myung Seok of Christian Gospel Mission is a believer of God who lives only for the sake of saving lives, and was recently recorded in a larger, revised edition of ‘The Encyclopedia of Korean Poetry,’ which represents 100 years of the history of poetry in Korea (1908 ~ 2010). Poet Jung’s name was recorded on page 2717 of The Encyclopedia of Korean Poetry, published last March. Poet Jung Myeong-seok’s book, ‘Spiritual Poem’, became a best seller in 1989. He officially became a poet through ‘the Munyesajo (Literary Movements and Trends) Writers Association’ in 1995, and had the spotlight shone on him in the world of Korean poetry and literature. Since then, Poet Jung has never slackened in his writing of poetry as he releases between three to five poems every month. He has now released around 3,000 poems. He has written around 30,000 proverbs of wisdom that he received through his life of faith and, among them, 6,000 proverbs were published in six books (Heaven’s Words, My Words). The large, revised version of ‘The Encyclopedia of Korean Poetry’ shows 100 years of the history of Korean poetry at a glance. It includes all the poets [of the 100 years], from the early poets in the history of Korean poets (Choi Nam-seon, Lee Yuk-sa, Lee Sang-wha, Jung Ji-yong), to the most recent poets (Jung Hyun-jong, Cheon Yang-hee, Hwang Dong-gyu). [The book includes poetry from] poets who have deceased, poets who were lost due to being kidnapped to North Korea or defecting to North Korea, and poets who are still alive.